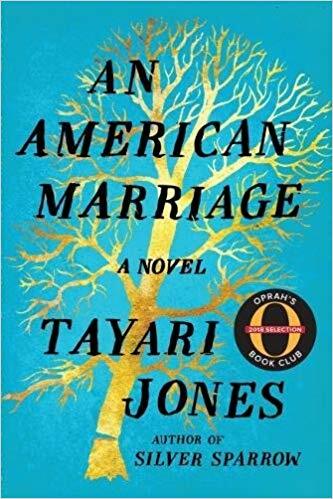 Come join the Collingswood Reads Book Club throughout May, June and July and discuss the picks for the coming months. The Book Club meets once a month, typically on the forth Wednesday of the month, from 7pm-8pm. The club meets in the Library's Peter Childs meeting room and include snacks and awesome people! Visit the Dining out for Life SJ Facebook page here. Here's food for thought. 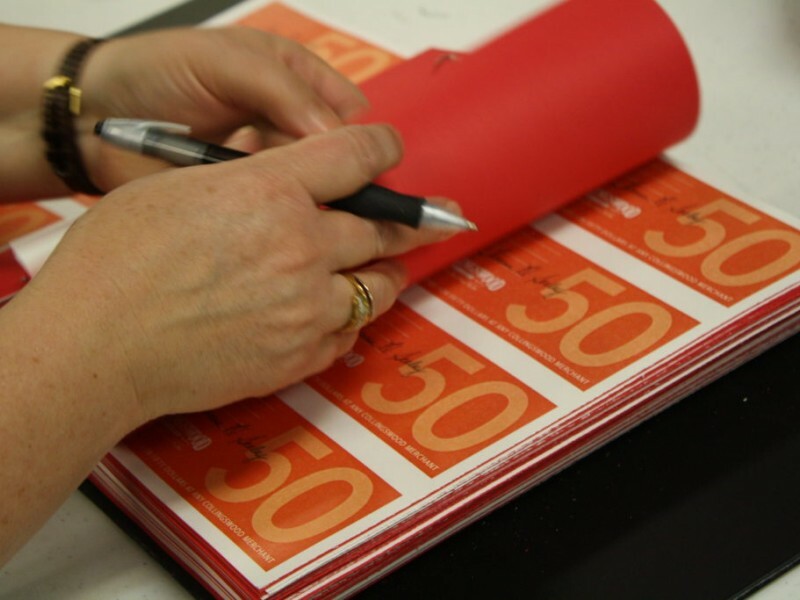 Through the ordinary act of dining out, you can have an extraordinary impact on your community. 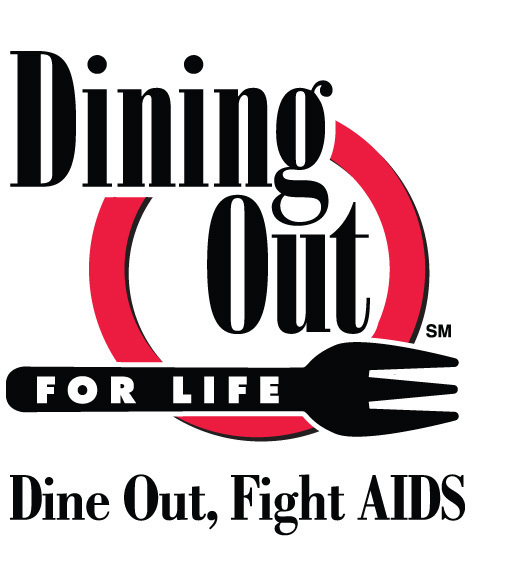 Make a reservation for Dining Out For Life on April 18, 2019. Participating restaurants will donate a generous portion of your check to support HIV/AIDS services in your city. Invite friends, family and co-workers to join you and you can make a meal meaningful by Dining Out For Life. That’s the message in the latest commercial for Dining Out For Life, which returns to the Southern Jersey area on Thursday, April 18. Over 150 restaurants will again participate across the Delaware Valley, and each donate 33 percent of their food sales for the day to local HIV/AIDS service organizations. The event, sponsored by Subaru, raises nearly a quarter of a million dollars each year, which is essential in a region with four times as many people infected with HIV/AIDS than the national average. In Collingswood, dine at El Sitio Grill & Café, L’Oceano Ristorante, Nunzio Ristorante Rustico, Sabrina's Collingswood, Oasis Mexican Grill, Sapori Trattoria and Villa Barone to give back. The monies raised on April 18 in Philadelphia, Southern Jersey, and Delaware are invested through local non-profits to only fund care, prevention, education, testing, counseling and other essential HIV/AIDS services across the region. In addition to ActionWellness, beneficiaries include AIDS Delaware and Camden Area Health Education Center. 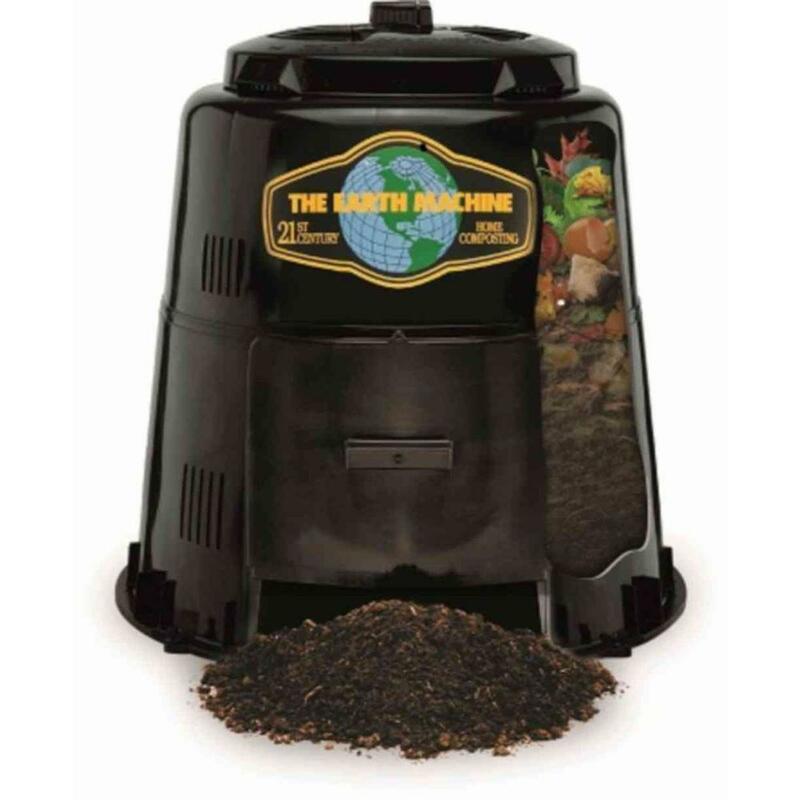 In honor of Collingswood 11th Annual Green Festival, Earth Day and America Recycles Day the Borough of Collingswood and Camden County are excited to offer residents compost bins and rain barrels at 50% off retail prices. Supplies are limited and online sales end April 10. All orders will be available for pick up on Saturday April 13 at the annual Collingswood Green Festival. Collingswood's spring Town Forum will start with an hour dedicated updates and feedback regarding our Public Safety Facility project. 6PM: Special forum to specifically discuss public safety facility updates before our regular forum event on April 17, 2019 at the Scottish Rite Ballroom. We will have a PD/FD focused portion at 6pm and move on to our general town forum at 7pm. 7PM: Residents and business owners are welcome to attend an open forum on the Borough. Do you have questions for the Mayor and Commissioners? Come out and share your ideas for Collingswood! The forum begins at 7 p.m. at the Scottish Rite Ballroom (315 White Horse Pike). All are welcome! For more information call 856-854-0720 x125. Travel the world with us this spring! 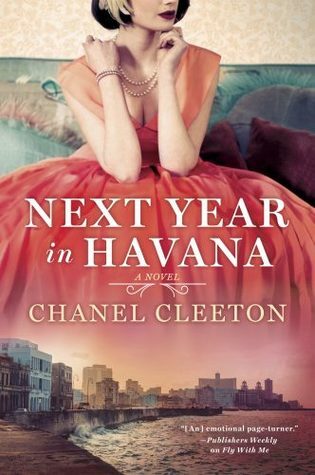 We’ll go time-travelling and globe-hopping with Moonglow, and then we’re off to Cuba with Next Year in Havana. Collingswood reads is a book club that welcomes adults and teens. 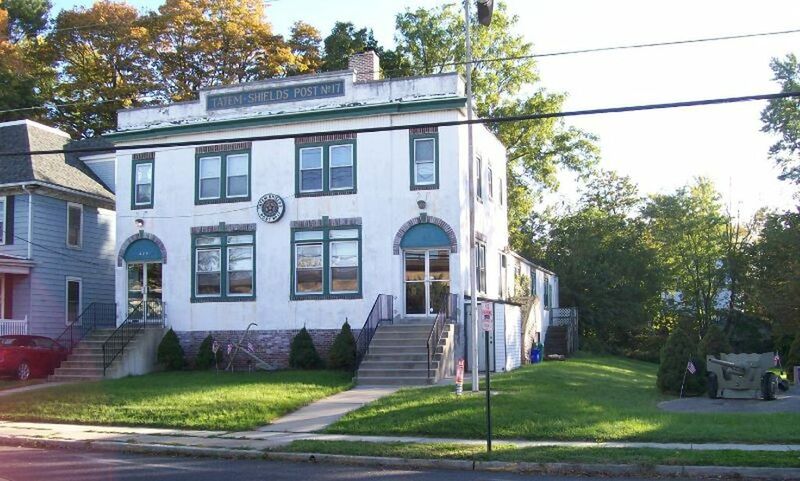 Meetings are the fourth Wednesday of each month at 7 p.m. at the Collingswood Public Library. 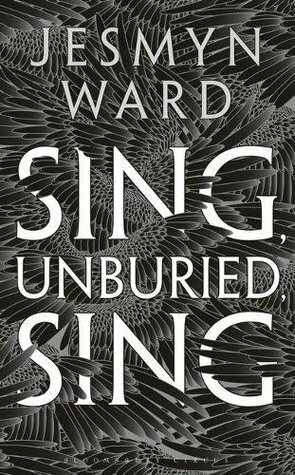 Desc: This novel revisits an entire era through a single life and collapses a lifetime into a single week. A lie that tells the truth, a work of fictional nonfiction, an autobiography wrapped in a novel disguised as a memoir, Moonglow is Chabon at his most moving and inventive. See information on Roberts Pool concession stand manager employment opportunity here. AARP Tax-Aide is returning to the library starting on Friday, February 1, 2019 and will be at the library on Fridays through April 12. The Tax-Aide sign-up begins (in-person only) at 9:30 am at the library. Due to the complex nature of tax returns, AARP can only assist a limited number of people each day, so arrive early to get on the top of the list! “Maintaining our roads is so important to the day-today life of our residents. It literally impacts them every time they pull out of their driveway so it’s a key service but also a costly one. That’s why we are investing $1 million of capital spending to roadways this year,” said Collingswood Mayor James Maley. These road projects will cover nearly 3,000 feet of roads as well as other repairs and improvements, like curbs, along some stretches. See an overview of roadwork maps here. Roads were evaluated and projects prioritized by need and road damage. Additional road repairs are always being assessed on an as-need basis. To report potholes or other issues, citizens can use the “Report an Issue” button on Collingswood.com. Appraisals are $5 per antique. Appraisals are on a first come first served basis and guests are limited to bring 10 items per person. After your appraisal spend the evening enjoying the art and music of 2nd Saturday throughout Collingswood's downtown. RSVP for dinner along SJ's restaurant row and do a little shopping while you stroll mini-art exhibits and culture along Haddon Ave! 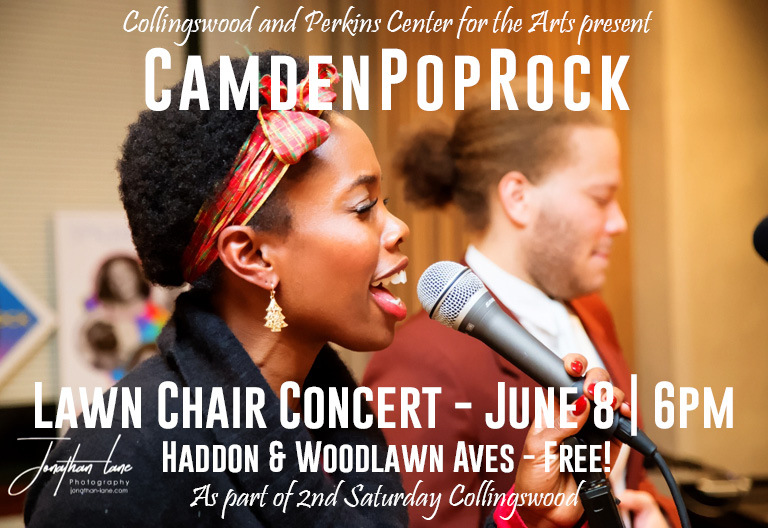 2nd Saturday is Collingswood’s monthly art and music event. Experience dozens of one-night art exhibits tucked in retail shops, restaurants and spots on each block as well as the shopping and dining Collingswood is known for. As always, 2nd Saturdays are free. Just visit Collingswood, stroll and enjoy the culture - on us. 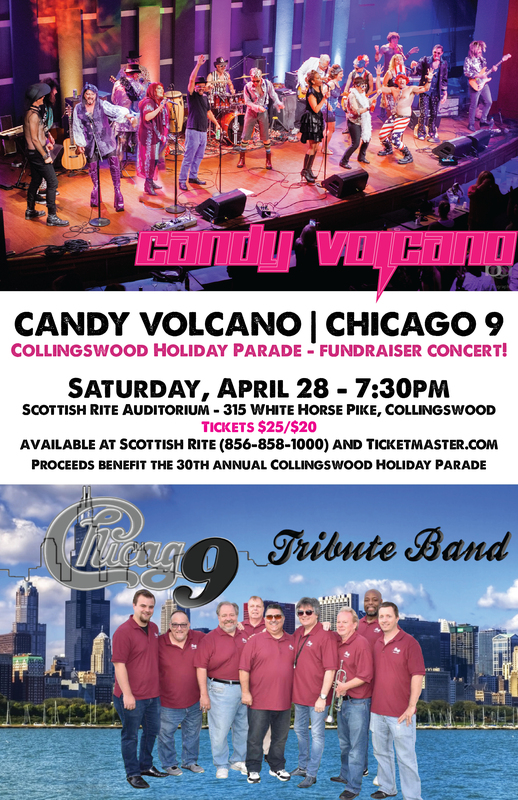 Learn more about visiting or participating in 2nd Saturday by going to Collingswood.com and clicking on the Arts & Entertainment tab. Collingswood businesses dress up to win storefront decorating trophy! There’s a showdown in Collingswood. A storefront showdown! For the holiday season, Collingswood is celebrating the breathtaking, the whimsical, the creative, the wacky and the most beautifully decorated seasonal storefronts in their second holiday decorating contest. Collingswood businesses are typically decorated elaborately for the Borough’s holiday season – painted windows, garland, figures and lots of creative themes that make the shopping and dining districts look magical. This year 29 businesses are competing to win the honor of “People’s Choice” favorite window through online voting and the competition is fierce (and breathtaking). 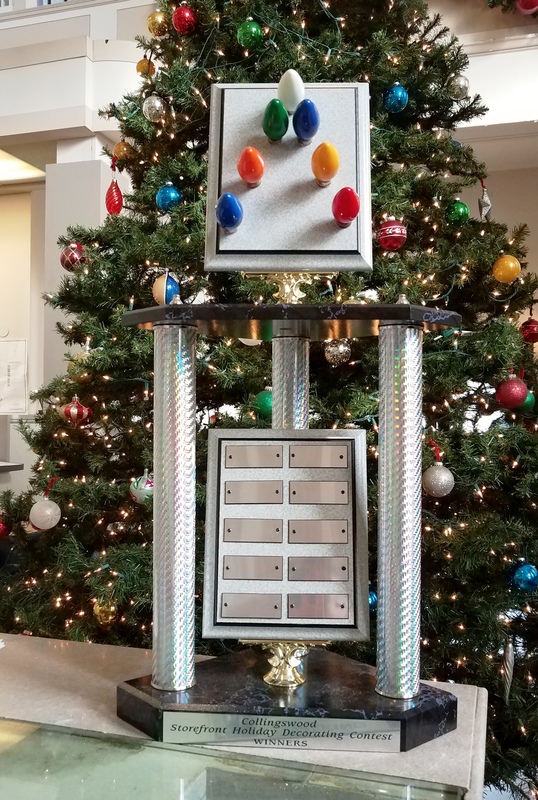 Also new for 2018 is the official trophy of tackiness – the business with the most votes at the end of the contest will walk away with the honor of adding their name to the trophy and keeping it until the holidays in 2019. 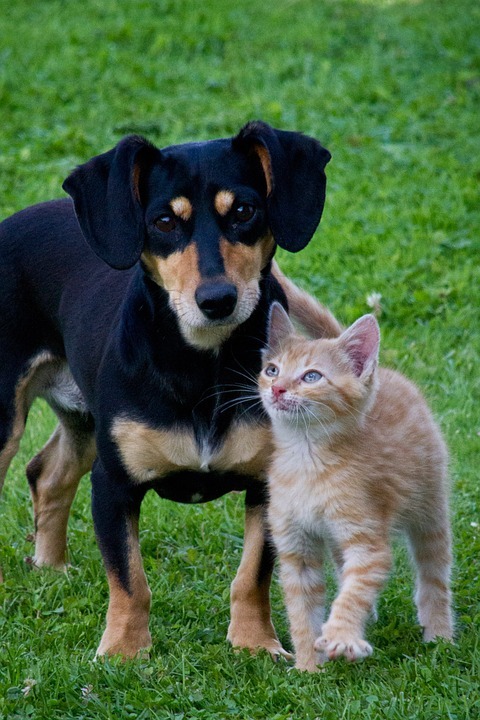 Vote by “liking” your favorite storefront pictures and then share the gallery to spread the joy! Or see the stunning displays in person by coming to Collingswood and then voting online! Stroll our downtown for the region’s best dining and unique gifts in a winter wonderland. 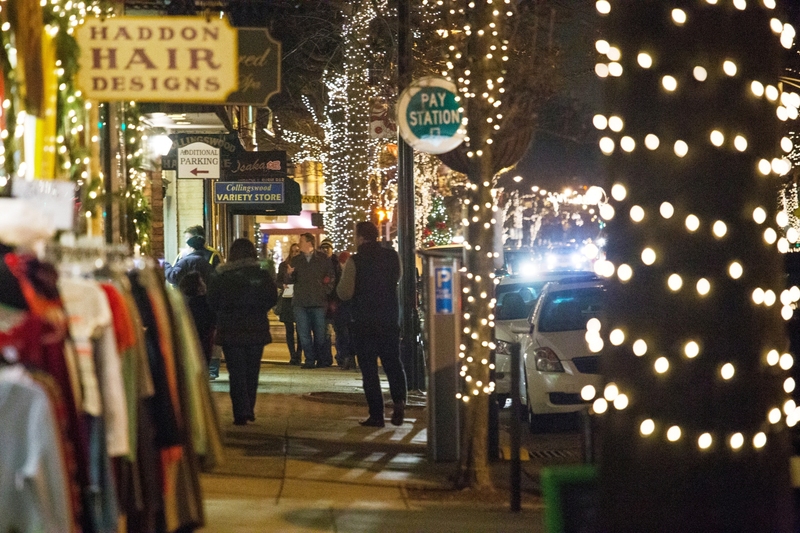 From November to the New Year, Collingswood is bursting with holiday cheer. Enjoy singers and snow in downtown Collingswood Fridays and Saturdays, FREE visits with Santa, special events, shopping and dining deals and the charm of more than a quarter million lights decorating our tree-lined streets! 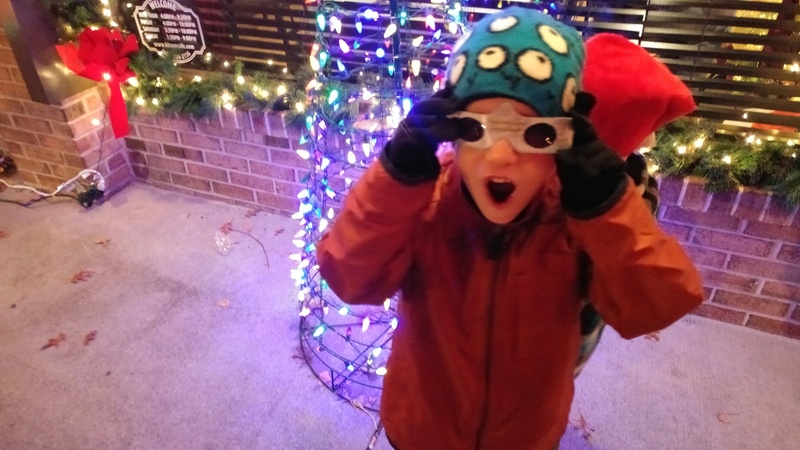 Pick up free Holospex at select merchants each weekend to view our light display as thousands of fun images. Plus, shopping hours are extended by many merchants in December with FREE PARKING throughout the month. For more information visit Collingswood.com. 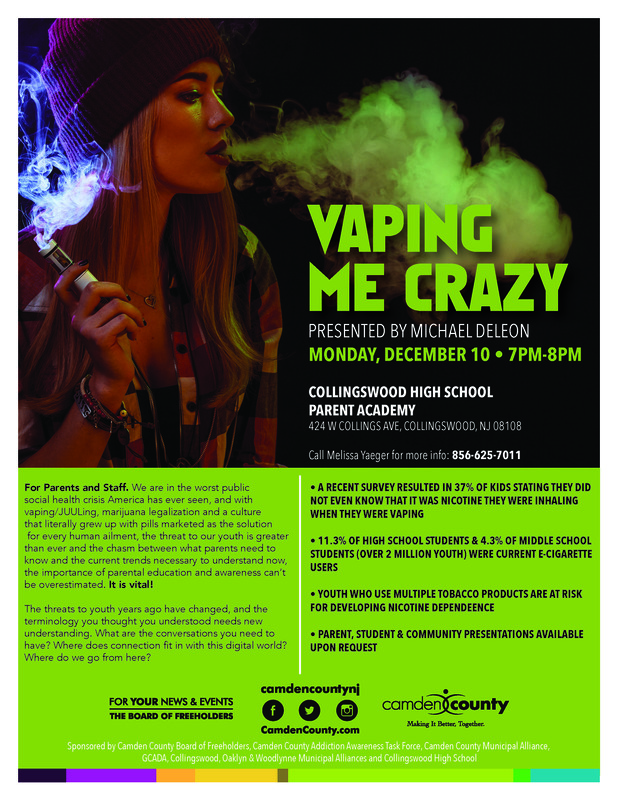 Meeting for parents and staff - We are in the worst public social health crisis America has ever seen with vaping/JUULing, marijuana legalization and pills marketed as the solution for every human ailment. A recent survey showed that over 2 million youth were current E-Cigarette smokers and that 37% of kids did not even know that it was nicotine they were inhaling when they were vaping . The threats to youth years ago have changed, and the new terminology you thought you understood needs new understanding. What are the conversations you need to have? Where does connection fit in with this digital world? Where do we go from here? Learn about current trends and terminology at Collingswood High School (424 W Collings Ave) on December 10 from 7 p.m. to 8 p.m.
After months of planning and several initial meetings with residents, Collingswood officials are hosting two public design feedback forums regarding the public safety building planned for 434 Haddon Ave. The November 7 and December 5 events will present conceptual images of the new facility and invite a dialogue about aesthetics and next steps. Over the summer, officials have been working with USA Architects to create concepts for Collingswood's new police and fire building. USA used image polling at a June forum to help determine building styles that residents preferred and are working to incorporate "green" building standards and grants where available. "This new facility is a necessity for providing safety services considering the state of our current police and fire buildings. But it’s equally important that the new facility fits into our community so feedback is a huge part of this project," said Collingswood Mayor James Maley. "We're hoping to show first concepts and really hear what people like and don't like about this new space. Like all our projects, it really needs to match the fabric of town." 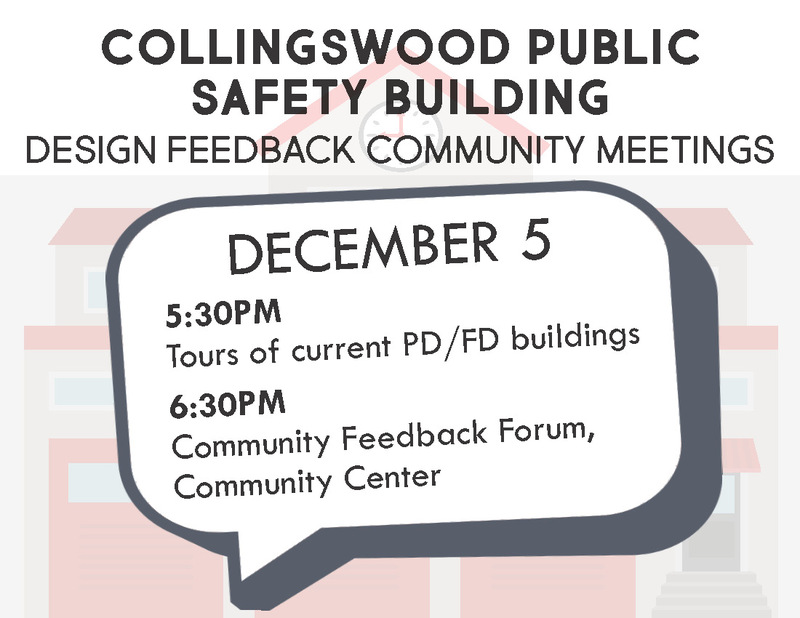 Public Safety facility feedback forums will be November 7 and December 5 from 6:30 to 8:30 p.m. at the Collingswood Community Center, 30 W Collings Ave. The December 5 event will also include tours of the current police and fire buildings starting at 5:30 p.m. at the Fire Department (20 W Collings Ave). Registration for our winter/spring program "The Lion King Jr." begins today. Students in grades 3 - 6 are eligible to participate. Information concerning the program and how to register will be on-line at http://cytnewjersey.wixsite.com/collsyouththeatre beginning Thursday, November 1 at 9am. Collingswood & Oaklyn residents may register starting Thursday, Nov. 1st at 9am. If our cast limit has not been met, out-of-town residents may begin registering on Thursday, Nov. 8th (not before). Elected officials from Collingswood are joining Environment New Jersey Research and Policy Center to host a "Ride and Drive" event to highlight the benefits of electric vehicles for New Jersey and oppose federal efforts to rollback clean car standards. Environment New Jersey's "Ride and Drive" events are an opportunity to showcase a variety of electric cars currently on the market, and give local elected officials an opportunity to test drive them. 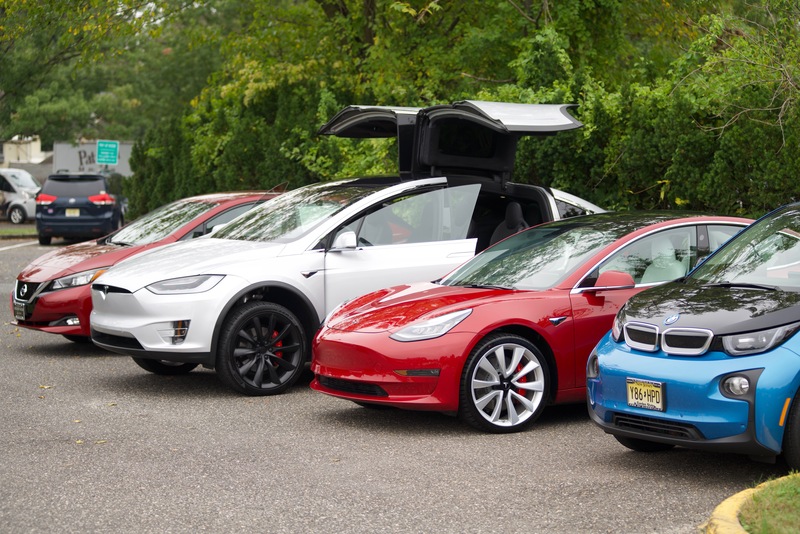 "Ride and Drive" events are meant to educate the public about the untapped potential electric vehicles can offer the Garden State, and how they protect our health, environment, and pocketbook. The Ride and Drive will take place in the parking lot of Collingswood Scottish Rite Auditorium (315 White Horse Pike, Collingswood) on November 1 at 11:30 a.m. Expected to speak and take some of the vehicles on a test drive on are Collingswood Mayor James Maley and Collingswood Commissioner Rob Lewandowski along with Doug O’Malley and Raquel Serruya from Environment New Jersey as well as Camden County officials. Photo credit Alan Simpson Photography. About Environment New Jersey: Environment New Jersey Research & Policy Center is a 501 C(3) organization dedicated to protecting our air, water and open spaces. They investigate problems, craft solutions, educate the public and decision-makers, and help the public make their voices heard in local, state and national debates over the quality of our environment and our lives. 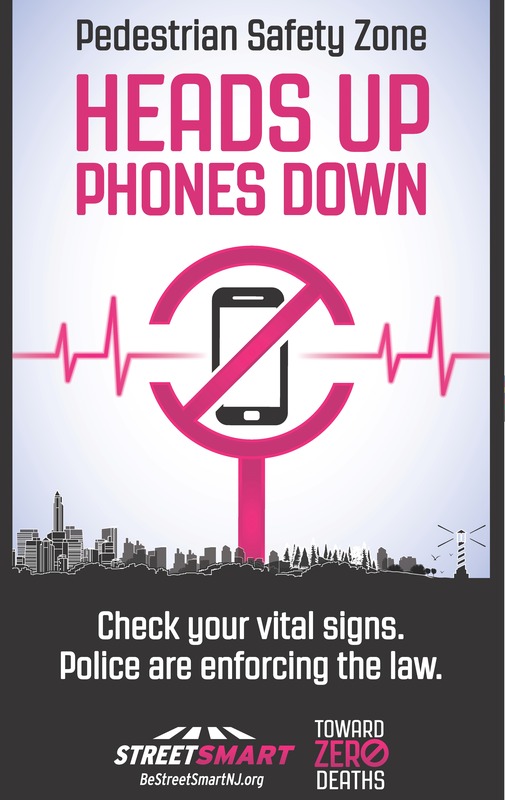 For more information, visit www.environmentnewjerseycenter.org. 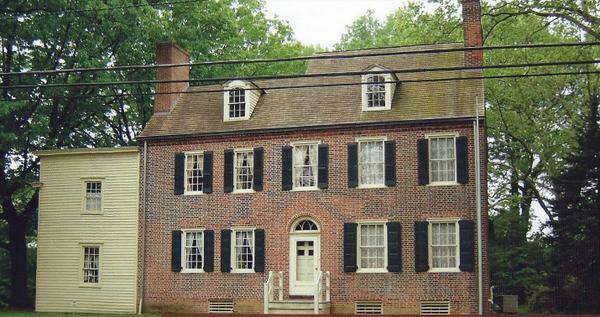 About Collingswood: Collingswood is a historic NJ town 10 minutes outside Philadelphia. Known for its eclectic downtown and BYO restaurant scene it has taken home national recognition including being named the Best Small Town Food Scene in America by USA Today, a Top 10 Transformed Community by Forbes, the Best Place to Go Car Free by Men’s Journal magazine, a Classic Town of Greater Philadelphia by the Delaware Valley Regional Planning Commission and a Great Place in America (Haddon Avenue) by the American Planning Association. 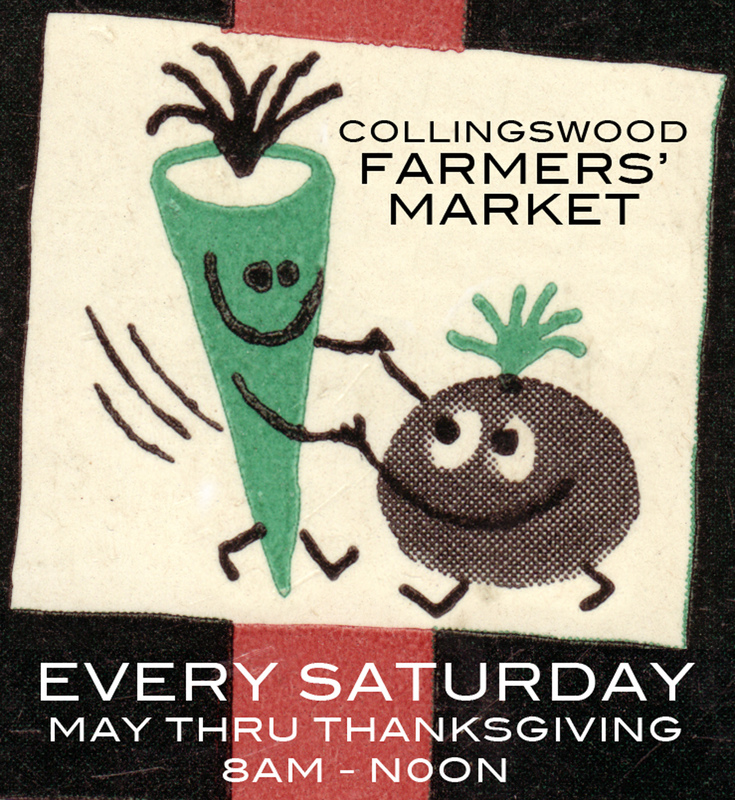 For more information visit www.collingswood.com. 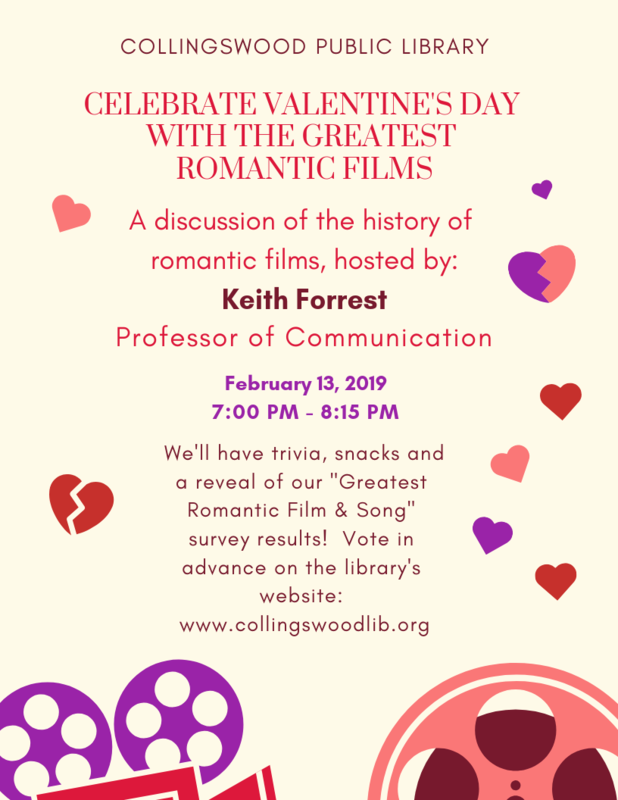 Here’s what’s coming up at the Collingswood Public Library! Our youngest residents can attend Building Blocks (18-35 months) on Fridays at 10am. This free hour long early literacy program addresses communication and sharing through stories, finger plays, and playtime. Ready to Read for 3-5 year-old participants adds snack and a craft to the mix when they meet on Thursdays from 10am-11:30am. 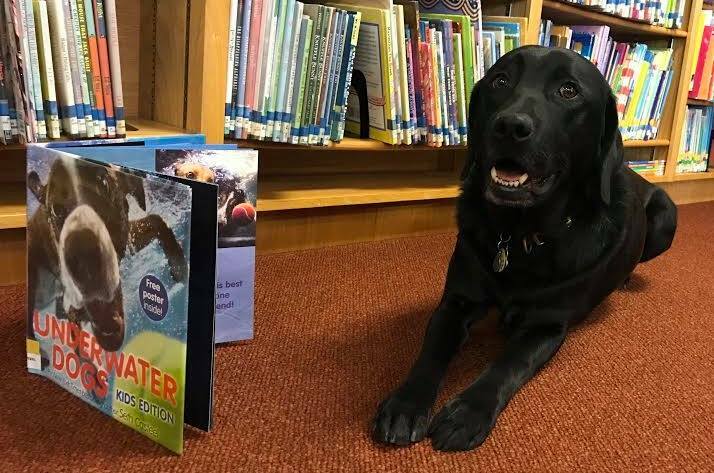 Therapy dogs Oswin and Minnie, along with their people, Judy and Deb, are ready to listen to readers in Kindergarten through 5th grade. Fifteen minute appointments are available from 4:30-5:30pm on the 1st and 3rd Wednesdays of the month. For specific dates about any of our programs, visit the library home page at Collingswoodlib.org. To register your child email us at youthservices@collingswoodlib.org. Dungeons and Dragons continues on the 2nd and 4th Wednesdays of the month from 3 to 5pm for 7th to 12th graders. Newcomers are welcome to join the campaign! Don’t forget teen Crafternoons on the third Monday of each month! On November 19 the theme will be autumnal crafts, including a flameless tea light holder. No registration required. Additional information about teen programs can be found at Collingswoodlib.org/about/youth/teens. On Monday, October 8 from 6 to 8 p.m. at the Collingswood Firehouse (20 W. Collings Ave), Collingswood residents, families and guests from around the area can enjoy a Fire Prevention and Public Safety Open House featuring games, giveaways and safety information and demonstrations as part of an effort to inform people and bring communities and their safety officials closer together. The festival is held in conjunction with Fire Prevention Week which held annually aims to remind residents about the importance of having working smoke alarms in the home and testing them monthly. According to the latest NFPA research, working smoke alarms cut the chance of dying in a fire in half. Meanwhile, almost two-thirds of home fire deaths resulted from fires in homes with no smoke alarms or no working smoke alarms. 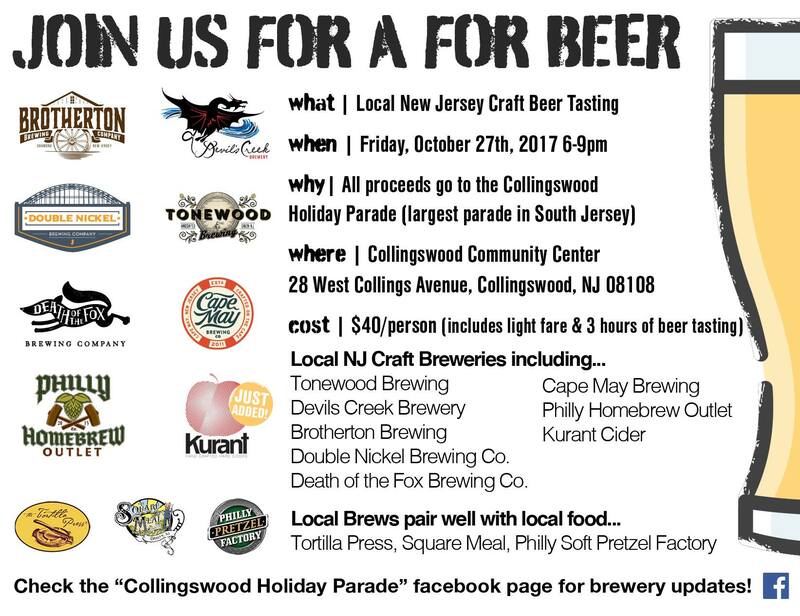 Collingswood’s event will feature fun, prizes, food, music and more. Guests can enjoy carnival games, police cars and fire trucks, fire safety education, public safety demonstrations, hot dogs, hot chocolate, prizes, free child IDs, face painting and balloon twisting, music, mascots, entertainment and ask questions of local fire officials and law enforcement agencies. “This is a great day to have fun with the community but there is a really important message along with all the entertainment and games,” said Collingswood Fire Chief Keith Davis. “Educating families and residents about fire and public safety saves lives. Any time we can share information about how to make homes safer it’s a great night. That’s the purpose and we’re so glad we can have a little fun with everyone while we spread that message.” Collingswood Police and Fire Departments as well as local vendors are pitching in for the event which aims to heighten crime prevention awareness and strengthen neighborhood spirit and community partnerships with police and fire departments. The event is staffed by volunteers from the Collingswood Police and Fire Departments, civic groups, government officials and local businesses. The 2018 Collingswood Holiday Ornament is here! 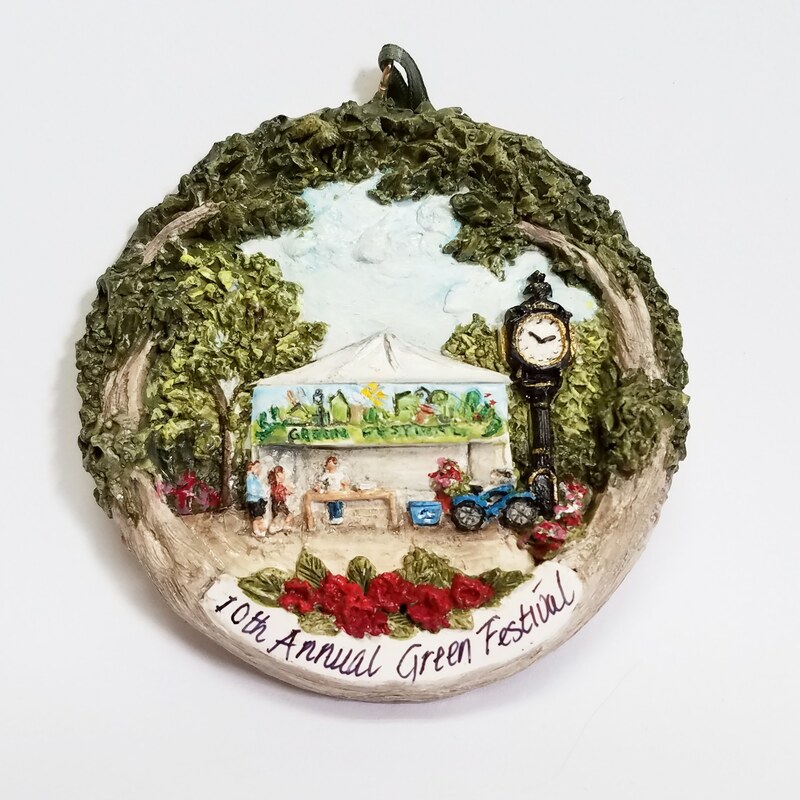 This year’s ornament honors the 10th anniversary of our annual Green Festival. 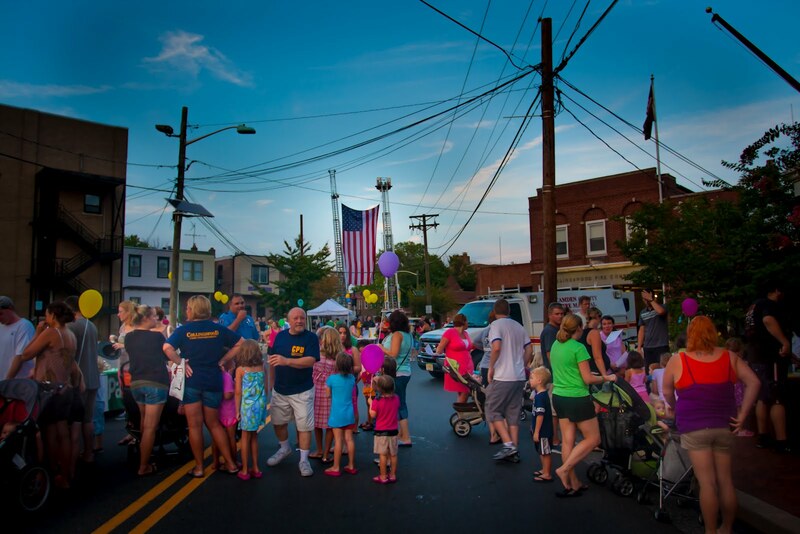 Each year Collingswood’s Green Festival brings together residents, businesses, vendors and volunteers alike to see how they can each make a difference in their community by working together to build a better environment. 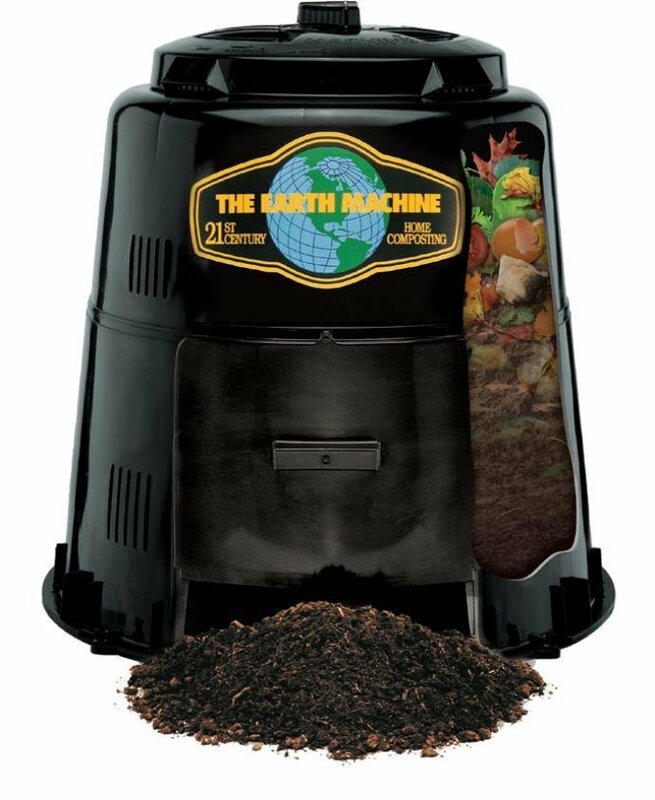 Through a variety of recycling opportunities, green-conscious vendors, and eco-friendly demonstrations, attendees learn what they can do daily to reduce waste. The festival began and has grown under the leadership of Commissioner Joan Leonard and this year's ornament celebrates the work of Leonard, green volunteers and all residents that are committed to living more sustainably. Collingswood’s Green Festival is just one of the eco-initiatives that make the Borough one of the greenest places in the Delaware Valley. Programs in Collingswood that encourage sustainability include the town’s bike share program, composter and rain barrel program, community gardens, rain gardens, car sharing (via Zipcar) and recognition as a Tree City USA by the Arbor Day Foundation. Bring that happiness into your home this holiday season with the 2018 Collingswood Holiday Ornament. Availability is limited so order yours today! Order forms found here. 2018 ornaments will be available for pick up upon notification at Dig This (717 Haddon Ave.). We need bakers! Do you have the best pie? Put those yummy Fall apples to good use! 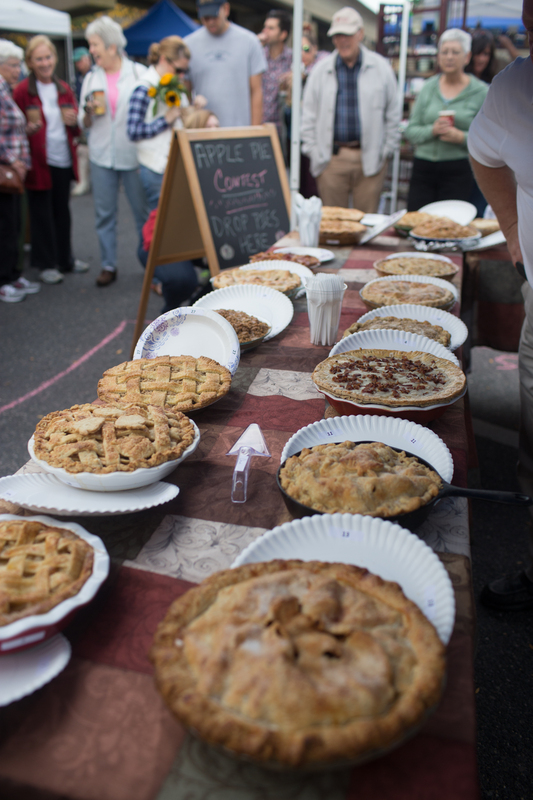 The Collingswood Farmers’ Market will be hosting their annual APPLE PIE CONTEST on Saturday, October 13. This is a perfect opportunity for you to make Grandma’s secret recipe or show off your baking skills. There are Market gift certificates up for grabs, so put your all into your pie! 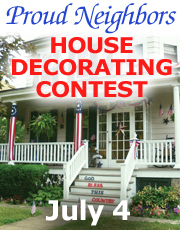 The contest will be at 10am in the judging tent at the Market. Pre-registration is a must! To register please visit the rules and registration page here before contest. 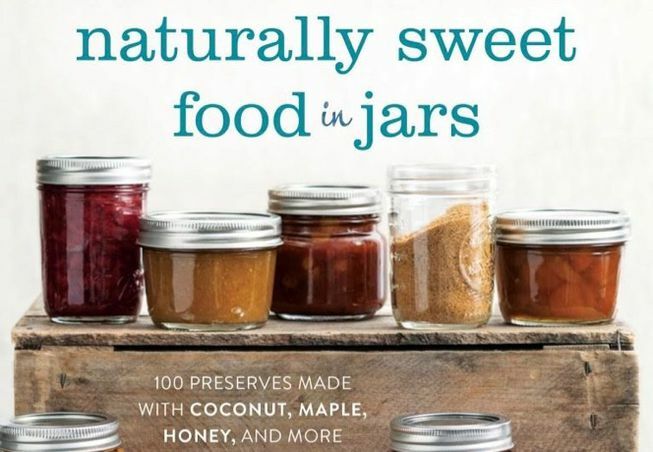 Thursday, August 30 from 7 to 8 p.m.
Marisa McClellan returns to the Collingswood Public Library with Naturally Sweet Food in Jars, her latest addition to the canning canon. Watch, listen, and learn about safe and shelf-stable canning. Marisa will show you how to preserve garden produce by making a small batch of homemade salsa! Collings-Knight House hosts "Wizarding Weekend"
Harry Potter fans, this one’s for you! Harry Potter fans young and old are invited to the Colling-Knight House’s first Harry Potter Event on Saturday, September 22. The historic Collings-Knight House (500 Collings Ave) will welcome witches, wizards, and muggles of all ages for games, house-themed challenges and demonstrations scattered about the house and grounds. 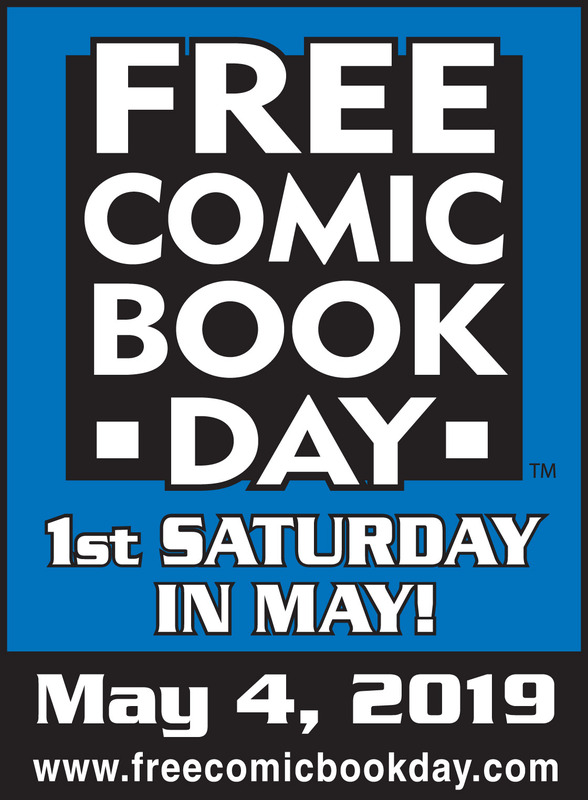 Some of your favorite characters will be there, too! Wear your house colors, your school robes, or everyday muggle-wear. Don’t know what house you’re in? No problem, we’ll sort you out! Earn points for your house with games and activities - the winning house will be rewarded at the end of the day. This magical event will run from 1 to 4 p.m. on Saturday, September 22 (rain date Sunday, September 23). Children must be accompanied by an adult. There will be an admission fee of $5 for adults, $10 per family. Follow the Collings-Knight House on Facebook as we update event activities, guest appearances and more! 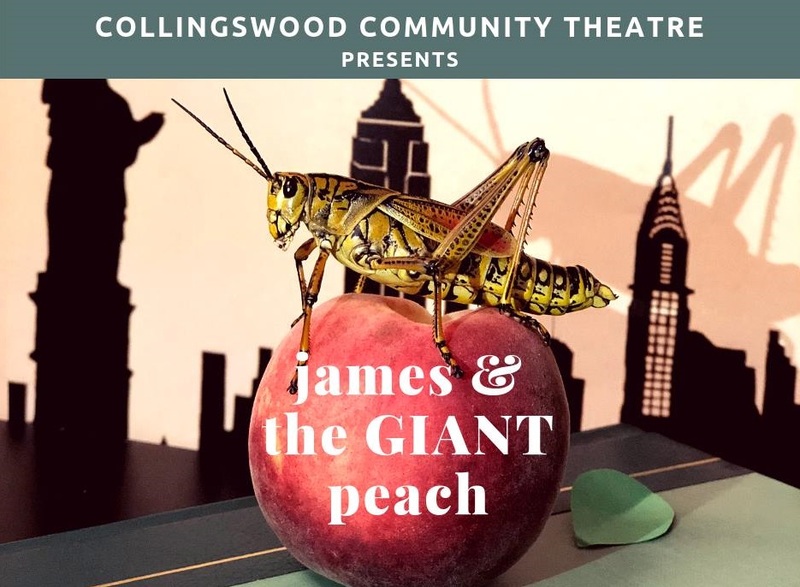 CCT presents "James and the Giant Peach"
Collingswood Community Theatre is excited to present the story of “James and the Giant Peach” live on stage at the Scottish Rite Theatre, 315 White Horse Pike, Collingswood, NJ 08107. It’s a great show for the whole family! Show dates are Friday, October 5 at 10am and 6pm and Saturday, October 6 at 10am and 1pm. All tickets are $10 per person and can be purchased at the door. Join us on Saturday, October 6 to meet some of the real-life buggy stars of our story. Live insects (and other creepy crawlies) from The Academy of Natural Sciences of Drexel University will take over the Scottish Rite between performances. Come face to face with cool critters, make your own silly shadow puppet, and enjoy some sweet snacks. Purchase tickets for either Saturday performance – 10am or 1pm – and enjoy the party from 11am to 12:30pm. Reserved seating and special group rates are available for groups of 10 or moreGroups of 10 or more will pay $7 per person. If your group is interested in attending any of the performances, contact Terry at cctartsterry@gmail.com or by phone at (856) 854-0720 x128. Make plans to join us for the show! This year New Jersey will produce over 66 million tons of peaches, making it the fourth largest producer of peaches in the nation. To celebrate this prolific bounty six Collingswood restaurants are once again showcasing this Jersey crop in their Just Peachy celebration. Just Peachy runs August 7 through the 9, though all of August is designed as Jersey Peach Month by the NJ Peach Council. 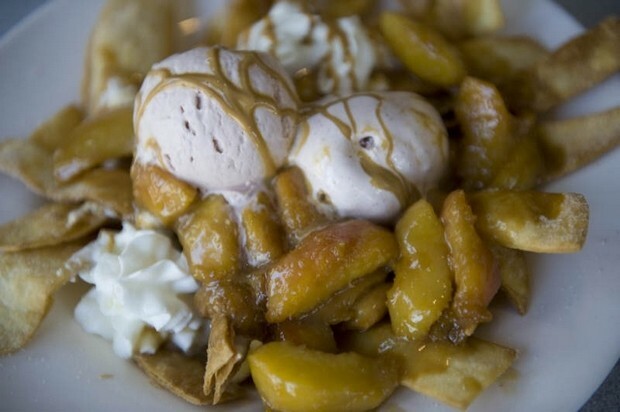 Participating restaurants will spotlight Jersey peaches on their menus as appetizers, entrees and desserts. Participating restaurants are The Tortilla Press, The Pop Shop, Villa Barone, Nunzio Ristorante Rustico, El Sitio and Centanni Pizza and Grill. Menu information and specials below. Make reservations during Just Peachy Week with individual restaurants. Third quarter taxes will have a final due date of August 29. There is no grace period for this payment. With questions, call the tax office at 856-854-0720, press 1 or visit the tax office page here. 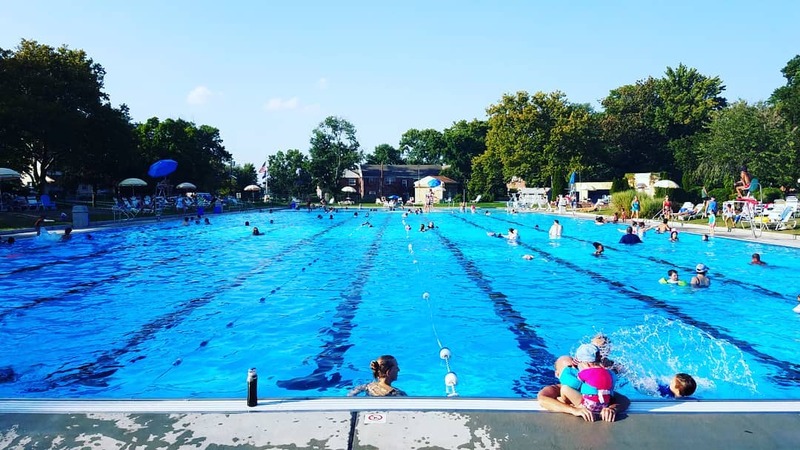 August pool pass sale - half off for the rest of 2018! 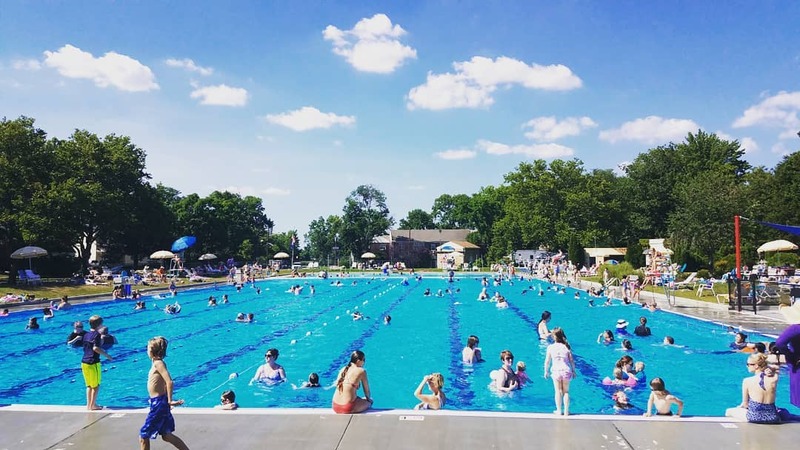 Starting Monday, August 6, 2018 passes to Roberts Pool are 50 percent off—that's right, half price! 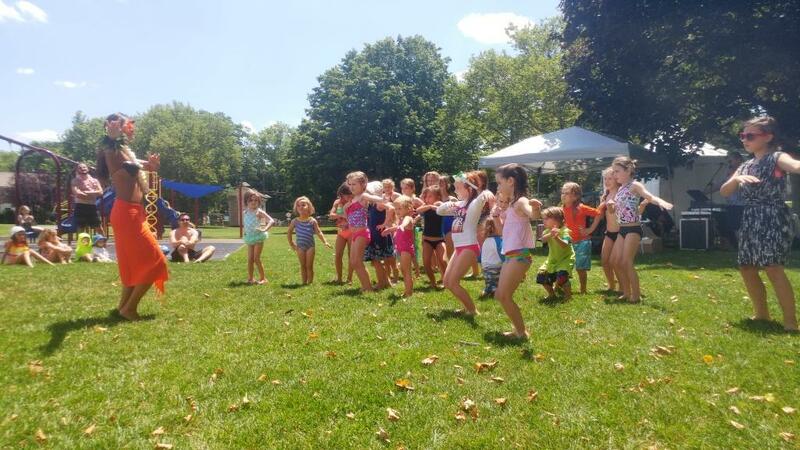 From noon to 4 p.m., purchase pool tags at Collingswood Borough Hall (678 Haddon Ave) or at Roberts Pool for the remainder of the season. Call 856-854-0720 x110 for more information. 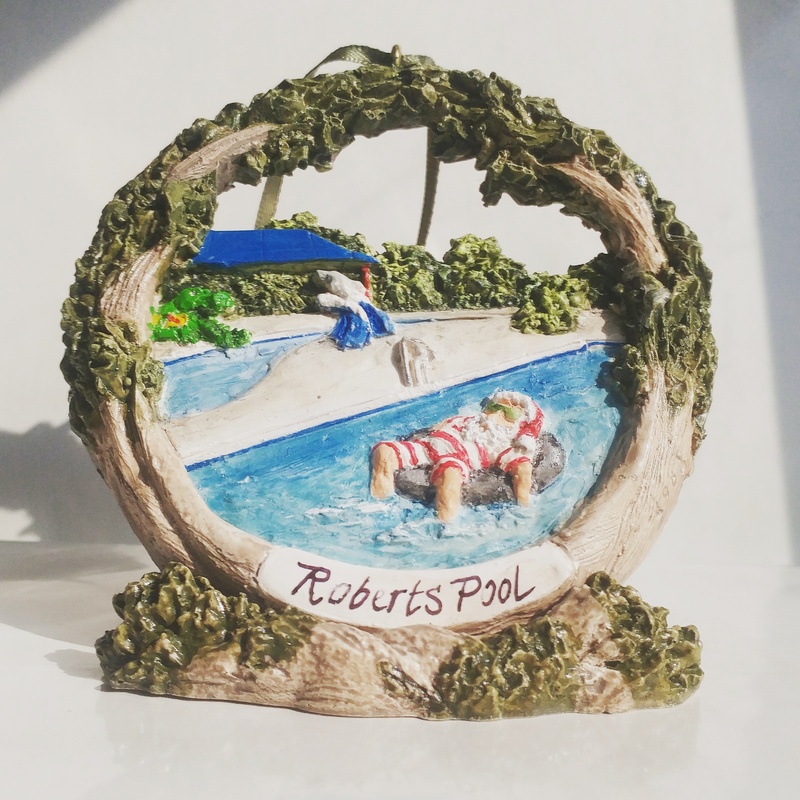 For more information on Roberts Pool, see the pool page here. Discounted August Swim Sale Pool Tag Rates – all half price! Perkins Center for the Arts Folklife Center in Collingswood (30 Irvin Ave) opened their Tastefully South Jersey Exhibition on July 12. The exhibition features cultural artisans who sustain Mexican, Liberian, Ghanaian, Polish, Turkish, African American South, Trinidadian, Haitian and St. Lucian food traditions in Burlington, Gloucester and Camden Counties. Special events celebrating cultures through food demonstrations, dance, storytelling, handcrafted art workshops and panel discussions will be presented from July 12 through August 25. The calendar of events include: Taste of West Africa and African-American Soul on July 14, Taste of Poland and Turkey on July 28, Taste of Mexico on August 18, Becoming American: It’s Not a Melting Pot…It’s Pot Luck on August 23 and concludes with Taste of the Caribbean on August 25. Through food, art, recipes, photographs, cultural artifacts, and interactive exhibits, the collection highlights the themes of South Jersey’s Own, Sharing the Bounty, Keeping the Tradition, a Pinch of This and a Drizzle, Food and Well-being,and Cookin’ on Canvas. From flavoring the palate with authentic ethnic foods to workshopping with traditional artisans, the Tastefully South Jersey Exhibition is designed to render an engaging and enriching cultural experience that celebrates the diversity of our communities. The exhibition and ancillary events are made possible by grants from the National Endowment for the Arts, The New Jersey Council for the Humanities, The New Jersey State Council on the Arts and the National Endowment for the Humanities. Perkins Center for the Arts is a unique cultural organization dedicated to excellence in the arts and to providing a wide range of creative opportunities for people of all ages and every level of artistic development. The Center's programs include visual and performing arts classes and lessons, exhibitions, music and dance performances, workshops, visiting artists' residencies, and an outreach program for children, underserved communities, and individuals with special needs. The Delaware Valley River Planning Commission announced recipients for its Transportation and Community Development Initiative (TCDI) grant program and Collingswood has been awarded $72,000 as part of a multi-municipal application with Haddon Township for a Bicycle and Pedestrian Enhancements Master Plan. TCDI funding focuses on linking land use and transportation planning. 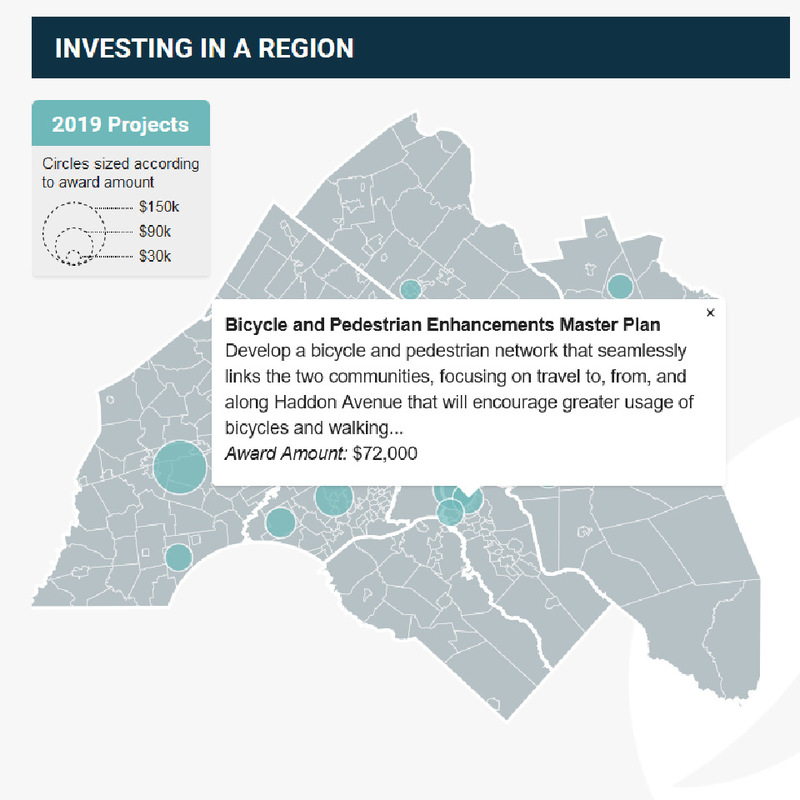 The goal of the Collingswood and Haddon Township Bicycle and Pedestrian Master Plan is to develop a bicycle and pedestrian network that helps to further connect the two communities with a specific focus on travel to the Haddon Avenue corridor and other assets throughout the two communities. Also, the study will look at the best way to create a seamless, safe and reliable bicycle and pedestrian network between the municipalities of Collingswood and Haddon Township will facilitate and encourage both utilitarian and recreational travel by walking and bicycling. Smart planning will maximize multimodal connections for visitors, commuters and residents to assets including NJ Transit bus connections, the PATCO Speedline, Zip Car (located in Collingswood), The Camden County Spine Trail, various public park trails, The Camden Greenway and The Circuit Trails of Greater Philadelphia and ultimately the East Coast Greenway. “Haddon Township is excited to partner with our neighbor in this effort to not only create links between our two communities but also to encourage more sustainable ways to travel to and from our towns and throughout the region,” said Haddon Township Mayor Randy Teague. Additionally, public input is a major factor in the effort. Community outreach, including surveys and public meetings, were listed as specific tasks in the grant application with the goals of analyzing conditions and getting feedback from residents and community groups of all backgrounds and abilities to identify and address problem areas for pedestrians and cyclists. The grant team’s goal is to create a plan that will meet current and future demands for safe and sustainable modes of transportation accessible to as many people as possible. Attend to be a part of the conversation regarding a proposed pilot ordinance in Collingswood to allow backyard chickens. Are you in favor of backyard chickens in Collingswood? Are you opposed? Do you want to learn more? The goal of this event is to provide the public with more information about backyard chickens in general and a proposed pilot ordinance. 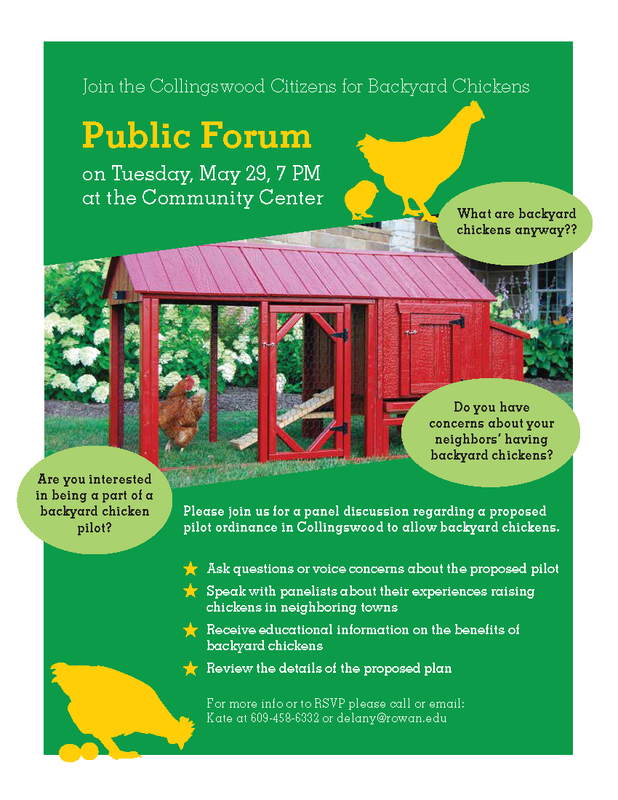 The Collingswood Citizens for Backyard Chickens organization will also give community members ample opportunity to voice concerns, ask questions, etc. Lots of participants from this group will be needed to help arrange, structure, publicize widely and of course, attend! Looking for a legit book club where people actually talk about the book? Join us for Collingswood Reads, the Collingswood Public Library’s very own Book Club! Adults and teens are invited to gather in the library’s Peter Childs meeting room to discuss the monthly book pick, meet neighbors, and munch on snacks. Check out our website at www.collingswoodlib.org or drop by the library at 771 Haddon Ave. to borrow our upcoming book picks - whether a paperback, an ebook, or an audiobook. Perkins Center for the Arts, Collingswood presents Photography 36 Award Winners Exhibition featuring three outstanding artists in photography. Carlos Chan- originally from Manila, Philippines and currently residing in Philadelphia, PA, “I primarily shoot urban landscapes because I am most at home in cities and because I find them endlessly fascinating. I like making sense of how they work, of what holds them together, of what makes them tick. The sheer organization alone that goes into them is, to me, a source of wonder and beauty”. Philip “Dutch” Bagley - “Photography can never grow up if it imitates some other medium. It has to walk alone; it has to be itself", from Berenice Abbott. This quote has encouraged my visual sense of direction…my pre-visualization of the final image as I am viewing and capturing the scene; see it, capture it, develop it and present it”. 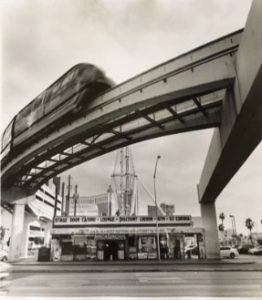 Philip Carroll, Curator and Karen Chigounis, Executive Director selected each artist, “For their level of professionalism and mastery of the medium through Photography”, which has been the mainstay of the Perkins Photography Exhibition now in its 37th year. 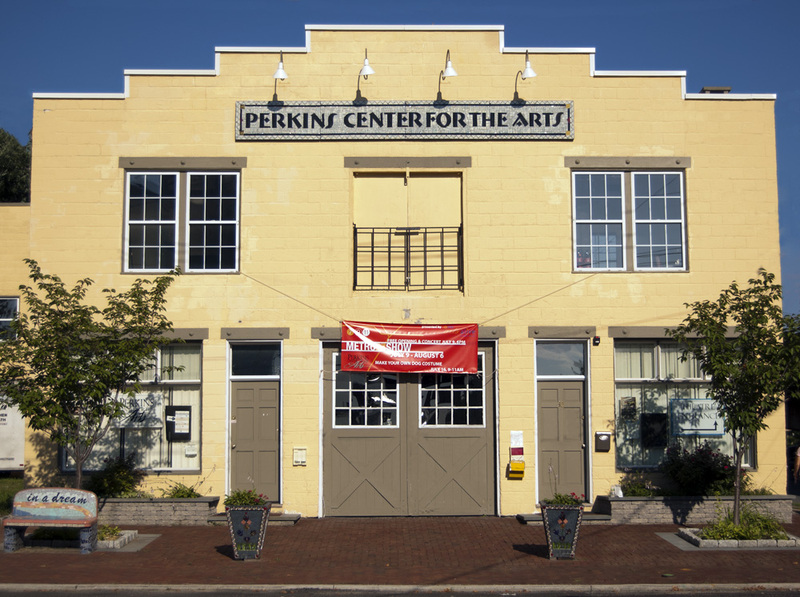 Perkins Center for the Arts is a unique cultural organization dedicated to excellence in the arts and to providing a wide range of creative opportunities for people of all ages and every level of artistic development. The Center's programs include visual and performing arts classes and lessons, exhibitions, music and dance performances, workshops, visiting artists' residencies, and an outreach program for children, underserved communities, and individuals with special needs. This exhibition is presented through a grant from the New Jersey State Council on the Arts/Department of State, A Partner Agency of the National Endowment for the Arts and Discover Jersey Arts. For more information call 856-235-6488. For event info visit http://perkinsarts.org/tag/photography-exhibition/. JEVS Human Services, a regional non-profit human services agency, is taking first steps to establish an independent living community for young adults with disabilities in Collingswood in 2018. JEVS Independence Network (IN) provides young adults with disabilities the freedom to learn and experience, and achieve their life’s goals. JEVS organizers hope that six to ten interested families will find housing, typically individual apartments, in Collingswood as part of the initial group. JEVS members live independently, with support from the organization, volunteer locally, and often work with the goal of living full lives as part of the local community. “The IN model is ideal for young people ready to live on their own who, with some support, want to realize their goal of independence, whether that means building their life skills, working, volunteering—or creating a full and meaningful community life”, says Jill Gromen, Director, JEVS Independence Network. JEVS launched a similar program in Narberth, PA in 2011 and hopes to replicate the successes of that program in Collingswood. JEVS offers a variety of activities and opportunities for members to lead fulfilling and productive lives. Each member, along with family members, work with staff to set his/her own goals and identify interests and needs. Resources help individuals as they work through challenges of being independent, while improving life skills, social skills, recreation skills, and work skills. Most of all, members are encouraged to make choices that help them improve their lives and build self-reliance and self-esteem. Collingswood appeals to JEVS because of proximity to transit, walkability, plentiful opportunities for engagement and employment, a busy event calendar and a welcoming community. Families and adults interested in living in Collingswood met at a January 6 information session in Collingswood to learn about this new opportunity, meet other young adults and their families who are interested in moving to Collingswood, to take a tour of the town’s amenities and discuss next steps for the creation of the model program in Camden County. For more information about JEVS Independence Network, contact Jill Groman at SupportsNJ@JEVS.org or 856-242-4710. About JEVS: Each year JEVS touch nearly 30,000 lives, focusing on individuals with physical, developmental, and emotional challenges as well as those facing adverse socio-economic conditions including unemployment and underemployment. Operating with an annual budget of $92.5 million, JEVS Human Services has 1,000 employees and 30 successful programs providing skills development, job readiness and career services, vocational rehabilitation, recovery services, adult and residential day services, and in-home personal assistance. Collingswood businesses compete in first holiday decorating contest! This year, there’s a showdown in Collingswood. A storefront showdown! For the holiday season, Collingswood is celebrating the breathtaking, the whimsical, the creative, the wacky and the most beautifully decorated seasonal storefronts in our first holiday decorating contest. Collingswood businesses are typically decorated elaborately for the Borough’s holiday season – painted windows, garland, figures and lots of creative themes that make the shopping and dining districts look magical. For 2017, twenty two businesses are competing to win the honor of “People’s Choice” favorite window through online voting. To see the competing storefronts visit Collingswood’s official Facebook gallery here. From November to the New Year, Collingswood is bursting with holiday cheer. Enjoy singers and snow in downtown Collingswood Fridays and Saturdays, FREE visits with Santa, special events, shopping and dining deals and the charm of more than a quarter million lights decorating our tree-lined streets! Pick up free Holospex at select merchants each weekend to view our light display as thousands of angels, snowman, reindeer and elves. Plus, shopping hours are extended by many merchants in December with FREE PARKING throughout the month. 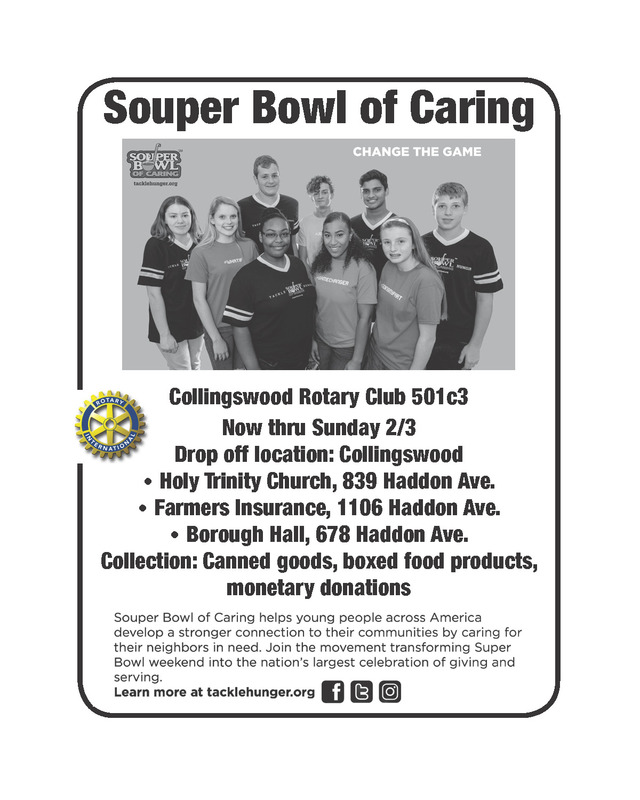 For more information see the Holidays in Collingswood page here! Building Blocks for ages 18-35 months and Ready to Read for 3 to 5 year olds will continue in the new year. Lego Junior (for 5 to 7 year olds) and Lego Club (for 8 to 12 year olds) will begin meeting twice a month in January. Want to Read to a Dog? Once again, therapy dogs Oswin and Minny will be on hand (or paw?) for K-5th graders as they build confidence reading to a non-judgmental listener. Check the Library website at www.collingswoodlib.org in the coming weeks for details on teen and children’s events. 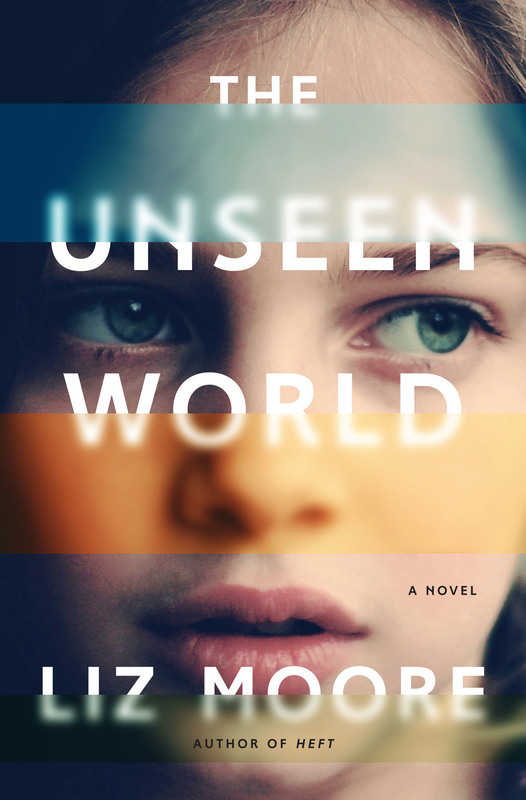 The 2017 Collingswood Town Book is The Unseen World by author Liz Moore. Moore will attend the annual Collingswood Book Festival on October 7, 2016. Every year, the organizers of the Collingswood Book Festival choose a town book, “to provide an opportunity for our entire community to bond over some of the great themes in literature,” said Jean Brennan, chair of the book festival committee. 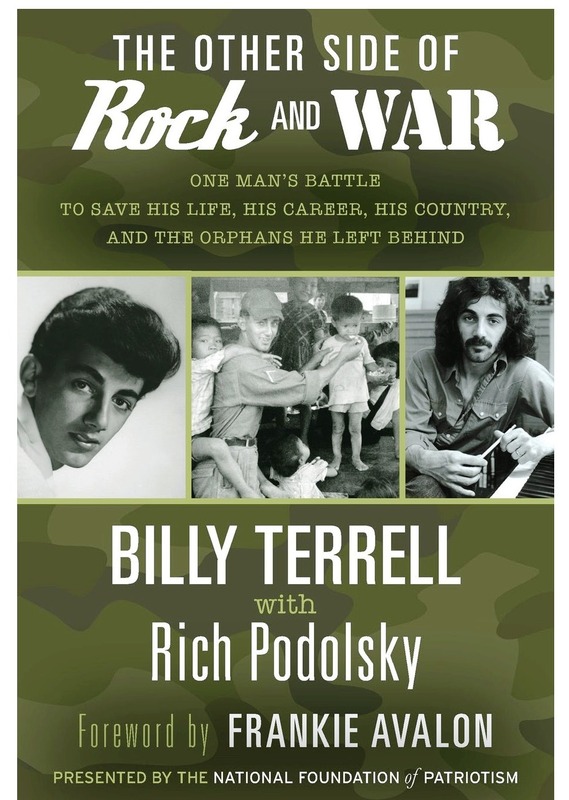 Copies of the book are donated to students of the AP English Class of Collingswood High School as part of their reading curriculum. 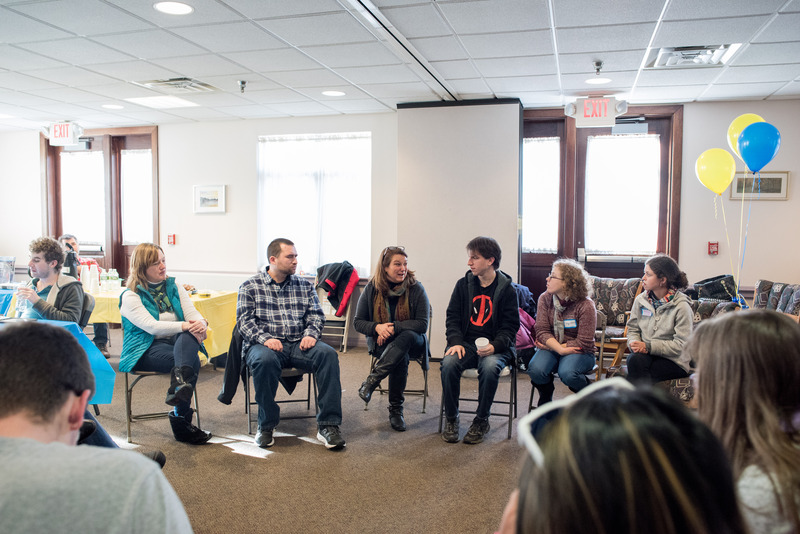 The festival provides a forum for discussion and analysis beyond the classroom and into the community through a discussion taking place at Collingswood Public Library during festival week. Over the years, students have examined such topics as life in Afghanistan, plagiarism, book banning and the demographic shift away from urban sprawl. 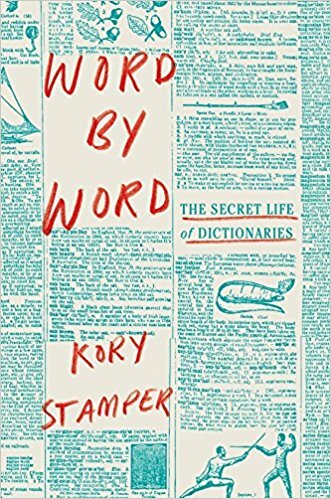 After several non-fiction books, this year’s town book is a page-turning story that spans decades and contains numerous interwoven plotlines revolving around sharply focused universal themes of family, love and identity. It is a timely and important exploration of the complex bonds between a daughter and her father, of the role of intelligence technology in human relationships. The Collingswood Book Festival includes authors and events for kids, tweens, teens and poetry fans in addition to top-notch adult authors. The free festival is set for more than six blocks along Haddon Avenue on October 7. More information will be added to the website in the coming weeks: www.collingswoodbookfestival.com. 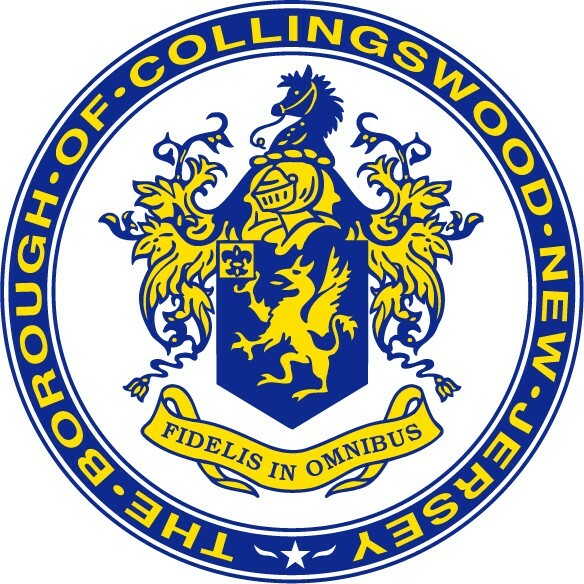 Twice yearly Collingswood hosts a Town Forum. Every resident and business owner is encouraged to come. There’s no formal agenda, no RSVP, no sign-in – just an opportunity to bring your questions, concerns or support to your elected officials or even just hear about what’s happening in town. The next Town Forum will be held October 24 at 7pm at the Collingswood Community Center (30 W Collings Ave). All are welcome. For info call 856-854-0720 x125. The Collingswood Police Department is partnering with the New Jersey Attorney General’s “Project Medicine Drop” initiative and provides a Project Medicine Drop box at the Collingswood Police Headquarters. 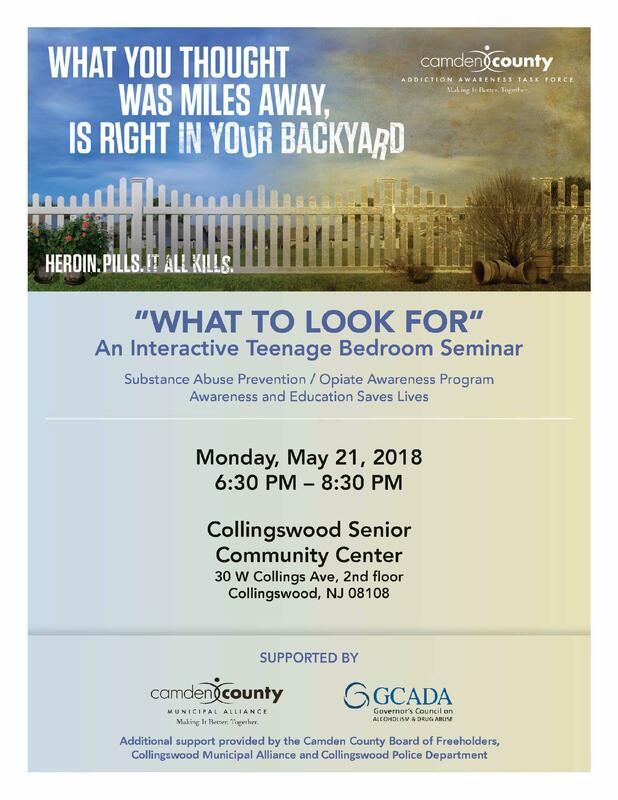 The Collingswood PD now makes it easier and more convenient than ever for Collingswood residents to take an active role in the fight against the nationwide epidemic of opiate and heroin abuse, which often is fueled by the abuse of prescription painkillers. By giving New Jerseyans a safe and secure method to dispose of unneeded medications, Project Medicine Drop helps prevent the abuse of these drugs. 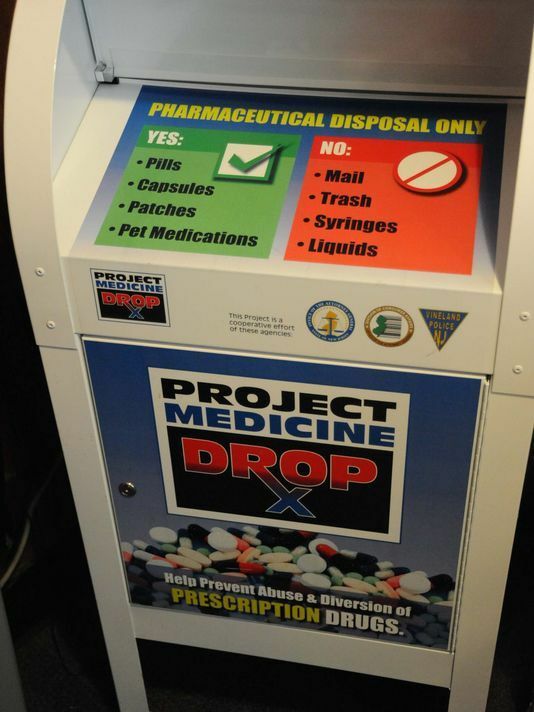 This initiative also protects New Jersey’s environment by keeping these drugs out of landfills and out of the water supply"
“Project Medicine Drop is a natural addition to our commitment to help improve the public safety and quality of life in Collingswood. It will encourage our residents to be fully aware of the potential for abuse presented by otherwise beneficial medications,” Collingswood Police Chief Kevin Carey said. More information about Project Medicine Drop, including the full list of Project Medicine Drop locations, can be found at NJ Division of Consumer Affairs. Welcome to the new Collingswood.com! Residents and guests of Collingswood – we’ve relaunched our digital home! With feedback from citizens, employees and business we’ve built a more user friendly site for visitors with all the important municipal functions you need and info on all the fun in town as well. Some areas are still a work in progress! What if I see something that needs to be changed or updated? Let us know! We’ve updated hundreds of pages of information but we need your feedback as we come across bugs or other issues. To report a broken link, typo or other issue use the “Report an Issue” feature (Communication category) and include the URL of the page with the issue and a description of what’s wrong! We look forward to your feedback and continuing to provide easy-to-access information for our residents and guests. Enjoy navigating the new Collingswood.com!